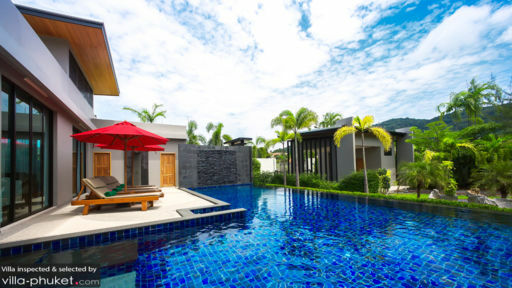 Villa Aroha is a compact, masterfully-laid out vacation residence that exemplifies the level of sophistication achieved by current Thai architecture and design. The villa makes full use of the property space – incorporating contemporary and stylish appointments and furnishings without compromising comfort and luxury. As well as elements that add a natural balance to the villa’s quite urban appeal. Villa Aroha truly has all the amenities and features you’d want in a vacation residence and, perhaps, even in your very own home. The villa has a total of four bedrooms. The master suite has a king-sized bed, a walk-in closet and a dedicated bathroom. 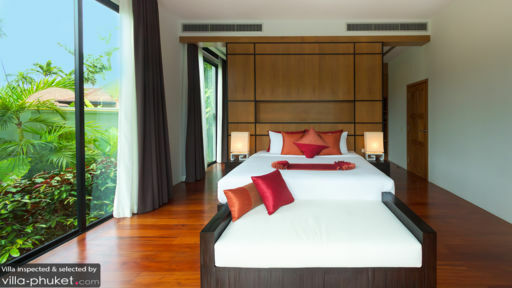 One of the bedrooms also has a king-sized bed, a view of the pool and the garden and a dedicated bathroom. Both bathrooms have a view of the garden through large windows partially concealed by big plants. Another bedroom has twin beds, a smaller walk-in closet and a dedicated bathroom. The last bedroom has a king-sized bed and a dedicated bathroom. The swimming pool extends from the villa. Its 15-meter length is enough to get your heart pumping as you do your routine laps. But if you’re in the mood for just a leisurely dip, the lazily flowing waters lull you to a level of calm and relaxation. Up on the pool deck, you can lounge on the cushioned pool beds under the shade of large pool umbrellas as you look out to the villa’s artistically-landscaped, extensive garden. Through floor-to-ceiling sliding glass doors is the living area with two sitting set ups. One has long couches facing a wide, flat-screen TV for the shows you just couldn’t miss. The other is just behind one of the couches – a circular, sunken section where you can all sit around for light conversation or long talks. A few steps from the entertainment set up is the dining area with a table that can accommodate up to six. Here, your culinary concoctions can be served – freshly-cooked and plated from the nearby fully-equipped, ultra-modern kitchen. Housekeeping in the villa is done twice a week. Preparation of meals as well as day trips can be arranged but will be charged separately. 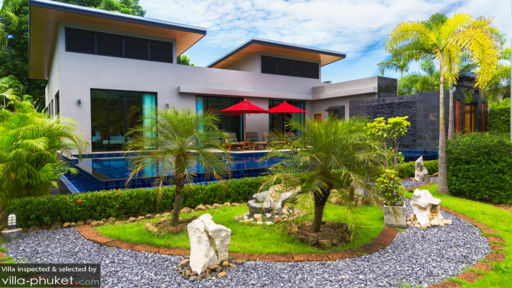 Villa Aroha is located in Nai Harn – one of Phuket’s most popular and relatively quiet beaches – ideal for swimming during the months of November to April. Further south are the sandy cove of Ya Nui and the tiny beach of Ao Sane – both fascinating snorkeling spots. While there, make sure you reach Windmill View Point for scenic views of Nai Harn Beach. One other must-see attraction is the landmark Wat Nai Harn. Must-try restaurants in the vicinity include Maggie And Mario’s Pizza, Da Vinci, De Renata, Rum Jungle Cafe and Promthep Cape Restaurant.